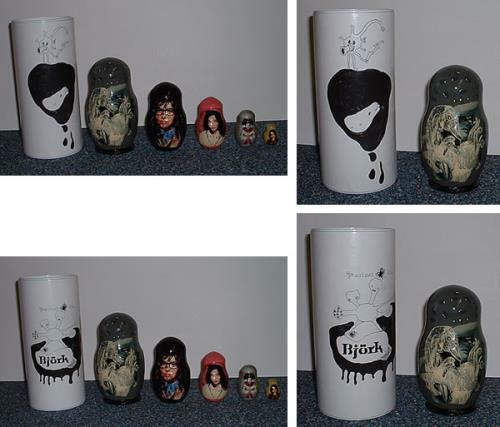 BJORK Greatest Hits Russian Nesting Dolls (Rare 2002 UK official One Little Indian promotional only set of five Russian nesting dolls. Each wooden doll is beautifully hand painted with an image from one of the last five albums - Vespertine, Homogenic, Post, Selmasongs and Debut. All housed in a 4" diameter x 9" tall cylindrical card tube, custom printed with the Greatest Hits sleeve artwork. Issued in very limited quantities, making this item a much sought after collectable! ).